102 ACRES W/ FRONTAGE ON BACK MOUNTAIN RD JUST BEFORE MOUNTAIN FALLS PARK ENTRANCE IN 5 SEPERATE TAX ID'S. GREENWAY ENGINEERING DID A SUBDIVISION PLAT (MAJOR RURAL SUB) IN 2006 NAMED "MAYA RIDGE ESTATES". UNRECORDED PLANS ARE AVAILABLE BUT WOULD NEED UPDATING TO CURRENT REGS. 19 LOTS PLUS (2) 5 ACRE LOTS WERE PLATTED IN 2006. VA. TREE FARM OF THE YEAR IN 2012. FOREST MANAGEMENT PLAN IS AVAILABLE. 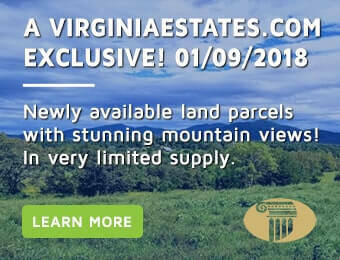 110+ acres in Stafford County located on Brooke Rd. Approximately 60% is wetlands, including Potomac Creek frontage. ideal for duck hunting, deer, etc. Hunters say there is an abundance of black ducks!!! Possible sites for home location. In land use, purchaser responsible for rollback taxes or can keep it in land use. Purchaser responsible for all studies etc,. HAS FIVE SUBDIVISION RIGHTS. An incredible property nested in the Piedmont region featuring a five acre spring fed lake and 1,994 of road frontage on Moreland Road. This parcel is undeveloped but has a constructed road with gate along the north side. Many mature hardwoods and nice views overlooking the lake. The George Washington National Park surrounds most of this property. It's located at the base of Massanutten Mountain. The plat states 185 Acres, but selling as 175 Acres (there's 9.76 Acres in overlap). There is one 20' right of way and two 15' right of ways. Beautiful rolling land with a mix of hardwood, hay and pasture. Water for livestock. Wildlife. "Locke Meadows" First time offered for sale outside the family since 1774! 70+ acres offering a mix of open and wooded land. Currently used as a popular horse show venue. Improvements include: 200'x350' sand and bluestone arena, 66'x97' Olympic sized dressage ring, moveable show office/secretary stand. Zoned AOC and allowed 3 DUR's. Seller is in the process of locating drainfields. Pond.